This was such a beautiful movie. I love true stories and cultural exchanges and this was definitely that. But the inspiring determination of the boy was the highlight of the film and his raw innocence when he arrives in the U.S.A.
Great artistry and well done movie. Brought history to life and the dancing was superb. Was a bit distracted by Bruce Greenwood's accent, but it may be because I've seen him in other films as my friends didn't have a problem. Wonderful...a movie with a warm heart. Love seeing a good movie about a real story! Loved the characters, the scenery and of course the dance. Enjoyed every minute! This is a very powerful movie with beautiful dancing. Although the politics have a bit of a Western bias, the journey and ultimate outcome of the protagonist is one that cannot be missed. Although films generally pale in comparison to the books(read it; saw it)this film touches upon the "right notes" to feel for its protagonist. Not hard on the eyes either! A truly wonderful experience which is an example of the old cliche about rags to riches.The human element is strong as we watch the trials and triumphs of Li as he struggles to attain personal and creative freedoms in his new milieu ,all the while never losing sight of his origins. Well-acted by the cast(many of whom are unknowns) and peerlessly photographed. Die Fledermaus is most creatively mounted. Rich,rewarding-even for those who are not particularly interested in the ballet. FOR A SELECT AUDIENCE. SUPERB, IF YOU KNOW BALLET. INSPIRATION FOR ALL. SHOWS BRAVERY TO STAND UP FOR YOURSELF. LUCKILY THINGS WORK OUT FOR BETTER. TIMING IS EVERYTHING. HIS FAMILY WOULD NOT HAVE FARED AS WELL TWENTY YR EARLIER. I loved the scenery, the dancing, the music and the human connection in this movie. Very special. Wonderful movie, loved the acting, music. Loved this movie -- so well done. A keeper for lovers of dance movies. Although this is an intriguing and inspiring story, the acting and the dialogue failed to move me; the dancing was superb but I did not connect with the characters....I read the book first and it had a much stronger impact. An excellent movie, with really really good performances. Very touching, beautiful movie. Very well done. Wonderful scenes of dancing and a great historical movie. An interesting biographical piece though I'm not keen on modern ballet. An important movie. A must see. 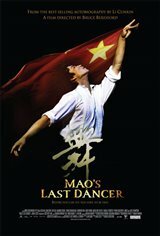 A poignant film which magnifies the political influence on the lifestyle of the people of communist China as well as on the people of democratic America. The power of one's family cannot be denied. The dance was magnificant, the music melodic to the ears, and the acting stupendous. Hats off to Bruce Beresford- FANTASTIC as Li Cunxin would say. A great combination - true story, great dancing, absolutely fabulous music, and terrific acting, particularly Bruce Greenwood! Don't miss this movie. Topnotch directing, scenery and script. Fantastic Evening!!! This is an AWESOME movie! it's about as good as it gets...true story, ballet, foreign diplomacy, romance. The BEST dance movie I've ever seen, except possibly, "Flashdance"! This one's a sleeper and not to be missed! This is a wonderful movie, great acting and a story that, with many flash backs, is easy to follow. Canadian Bruce Greenwood is terrific.